When I first started imaging with my Pentax K200D DSLR camera and FLT110 two things were instantly obvious. One was that the camera was totally inadequate for what I wanted to do. The second thing was that the William Optics FLT110 needed a field flattener. Both of these issues were resolved at that same time. 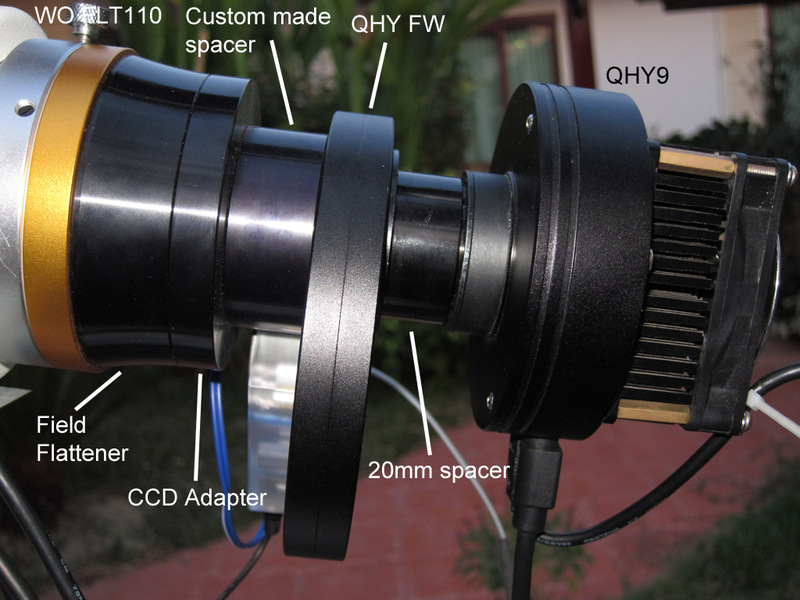 I bought a QHY9 mono camera and the dedicated field flattener for the FLT110 (P-FLAT68). This page briefly describes how I went about connecting the camera to the filter wheel of the camera. An important part of this process was ensuring that the distance between the lens of the field flattener and the CCD sensor was correct. That distance is 113.13mm. For my purposes 113mm was close enough. Below is a diagram showing this distance. The field flattener CCD adapter has a male M57x0.75 thread while the William Optics filter wheel has a female M48x0.75 thread. An adapter was required for this. I wanted to be able to place the filter wheel in either direction so I used a ProStar 20mm T-thread spacer between the QHY9 camera and the filter wheel. Measuring the distance between the chip and the outside of the filter wheel and the distance between the field flattener lens and the face of the CCD adapter I found that I needed 24.5mm more to get the chip to lens distance correct. I then had an adapter made to achieve this distance and allow connection between the CCD adapter and filter wheel. The photo below shows how it all goes together (click image for larger version). You may notice that there is a gap between the QHY9 optical window and the spacer. The threads on the spacer are little long. It butts up against a metal flange rather than the glass. So to the important bit: the results. I am very happy with the results. 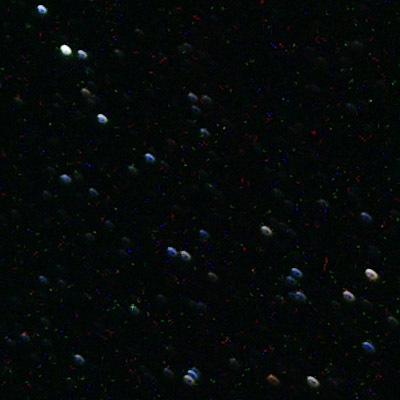 I am now able to get round stars right to the very edge of my field of view. The images below are before and after shots. 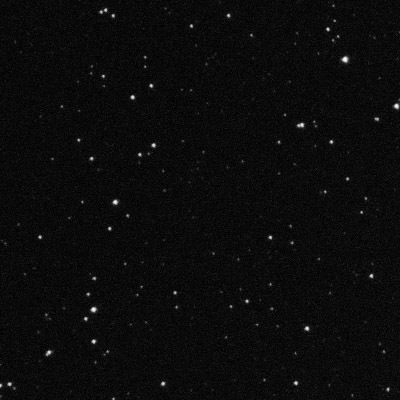 There are both taken from the extreme left-hand bottom corner on the same target but the stars do not match. Also remember that one is taken with a DSLR and the other with a cooled mono camera. The QHY9 CCD is smaller than the Pentax sensor. Note: I will likely improve this page with time. 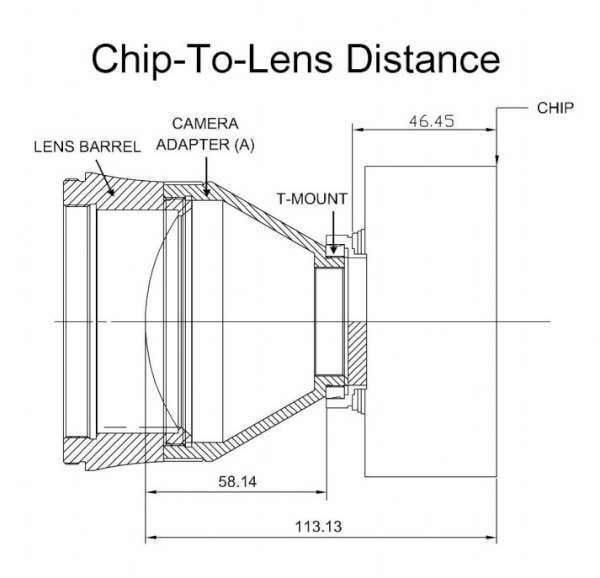 When I get access to them I will list the measurements that I took to get the chip to lens distance correct. If you would like an adapter made I can put you in touch with someone who can do it.